Established on November 19, 1986, AOET is a professional optical lens supplier committed to R&D, manufacturing and providing technical services of precision optical lens. AOET has rich designed and manufacturing experience in various optical lens products including scanners, projectors, digital cameras, multi-function printers, cell phone cameras, laptops, tablets, IP-cameras, monitors, automotive lens and so on. 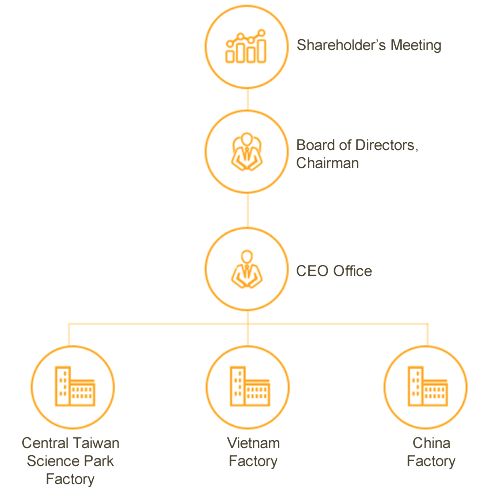 AOET is headquartered in the Central Taiwan Science Park and owns factories in Vietnam, China. In addition, established plastic lens injection molding factory in 2007 and automatic production line in 2009 at Central Taiwan Science Park. AOET is optical lens supplier which can provide glass and plastic optical elements. AOET’s R&D team is dedicated to optical lens design and development. Besides, the team aggressively develops lens for high-end cell phone. In order to improve process yield rate and production efficiency of high-end lens, simultaneously resolve effects on China’s lack of workers and rising labor costs, the team will continually expand automatic production line in response to the requirement of new product’s mass production and growing market. In face of the price competition from global giants and the rising costs, AOET will continually integrate global resources to strengthen the core competence for Taiwan operation headquarter. In addition, AOET expands the production bases from Taiwan to Vietnam, Zhenjiang and develops automatic process aggressively so as to meet the trend and achieve strategic objectives. Founded in 1986 and engaged in manufacturing, processing and trading of various glass lenses and lens assembly. Obtained ISO-9001 International Quality Certification. Invested and established a new factory in Export Processing Zone, Ho Chi Minh City, Vietnam. Successfully developed 1200 dpi, 1600 dpi and 2400 dpi scanner lens. Successfully developed 2 Megapixels lens for digital camera and entered mass production. Successfully developed 3 Megapixels lens for CMOS/CCD digital camera lens module and entered mass production. Successfully developed 4 Megapixels lens for digital camera. Invested and established a new factory in Zhenjiang Export Processing Zone, China. Successfully developed 5 Megapixels lens for digital camera and entered production. Obtained ISO 9001:2000 International Quality Certification. Successfully developed 1.3 Megapixels wide angle lens for PC CAM and entered production. Established Optical Plastic Division which is responsible for mold design and production of plastic lenses. Successfully developed customized VGA lens for digital video recorder and 1.6 Megapixels high resolution lens. Successfully developed 9 Megapixels and 10 Megapixels lens for digital camera and entered production. Successfully developed 200 degree ultra wide angle lens for automotive lens. Flat type optical multi-touch screen lens (TPM) entered mass production and obtained design patents. Obtained NB brand factory’s designation and became the major supplier of NB lens and cell phone lens. Successfully developed 5 Megapixels cell phone lens. Completion of developing HD wide angle lens for NB and cell phone. 5 Megapixels DV lens entered mass production. Successfully developed 8 Megapixels cell phone lens. Completion of developing thin type HD lens for NB and entered mass production. Developed wide angle lens for webcam. Completion of developing lens for gesture recognition and touch. Developed optical touch 2D/3D lens and entered mass production. Developed thin type FHD lens for NB and entered mass production. Developed cell phone front lens with FHD wide angle. Developed thin type 5 Megapixels lens for cell phone and tablet and entered mass production. Developed thin type 8 Megapixels lens for cell phone and tablet and entered mass production. Developed ultra wide angle lens for automobile. Developed and produced 13 Megapixels cell phone lens. Developed 16 Megapixels cell phone lens. Developed micro lens for medical endoscopy.